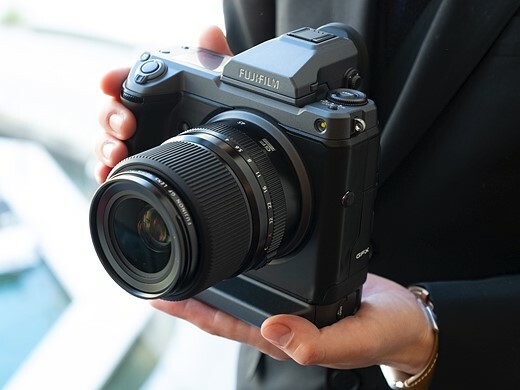 EXCLUSIVE: Hands-on with Fujifilm 100MP GFX Announced back at Photokina in September 2018, Fujifilm's next-generation GFX medium-format camera is getting closer to becoming reality. 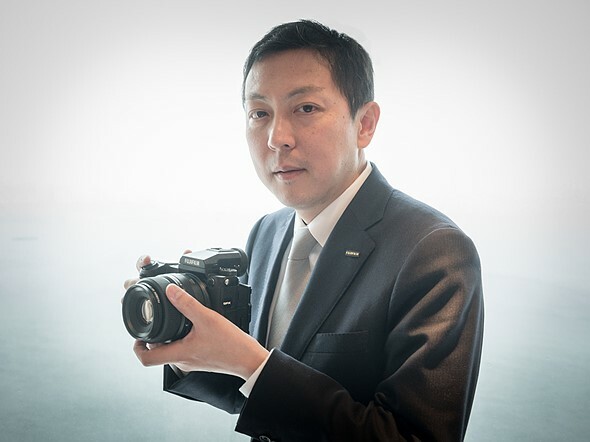 Sporting a 100MP BSI CMOS sensor and built-in image stabilization, the GFX 100 represents a significant evolution of the GFX 50S, which debuted the basic body shape and control philosophy of Fujifilm's current medium-format lineup. We're at the Gulf Photo Plus event in Dubai, where Fujifilm gave us a sneak peek at the first working prototype of the upcoming camera, to see for ourselves how it's shaping up. Click through for a closer look. At a casual glance, the GFX 100 looks a lot like a GFX 50S with a lighter gray finish and battery grip attached, and from an ergonomic point of view that's not too far off being accurate, in many respects. The 'grip' is integral to the camera, providing more space inside the body for large components like the mechanical shutter and IBIS unit, which has to stabilize a sensor 1. 7X the size of full-frame (43. 8mm x 32. 9mm). With the relatively lightweight GF 45mm F2. 8 attached, the GFX 100 feels more like a professional full-frame DSLR than a medium-format mirrorless camera. Exact dimensions and final weight are still secret, but my sense from handling the GFX 100 with the 45mm F2. 8 is that it has about the same kind of heft as something like a Nikon D5 or Canon EOS-1DX II with a fast prime attached. Inside the 'grip' is a tray which accepts two of the same NP-T125 batteries first introduced in the GFX 50S. 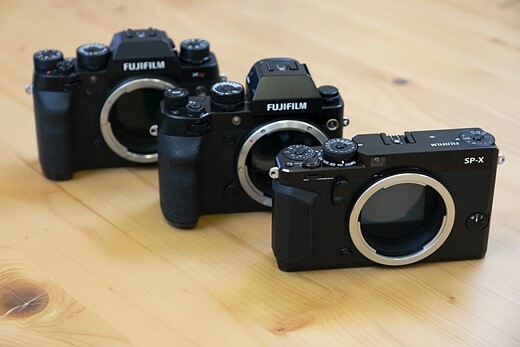 Battery life figures have yet to be confirmed, but I'm told that Fujifilm is aiming for around the same rating as the older camera, i. e. , ~400 shots (CIPA) per single charge, which would double presumably to ~800 shots when both batteries are loaded into the GFX 100. I/O ports are as expected, with microphone and headphone jacks, plus HDMI and USB, courtesy of a USB 3. 0 Type C port. A traditional PC socket is positioned on the side of the camera, under a threaded cap (just visible here between the two open port covers. While the exact details of expected performance are still secret, a quick hotel conference room handheld shooting test with the GF 45mm F2. 8 delivered plenty of sharp images at 1/20sec and a couple of acceptably sharp shots at shutter speeds as low as 1/6sec. Rest assured that as soon as we get our hands on a final camera, this is something we really want to test. A gallery of hands-on photos of the Fujifilm GFX 50S medium format compact system camera. The Fujifilm GFX is a 51.4 megapixel medium-format mirrorless camera. 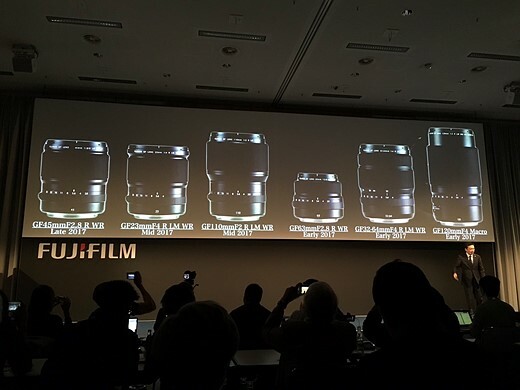 Photokina 2016: Fujifilm анонсирует среднеформатную систему GFX!